The image to the left depicts visitors viewing an art installation at the Refugee Exhibition. Please visit our photo gallery to view more photos from the exhibition. 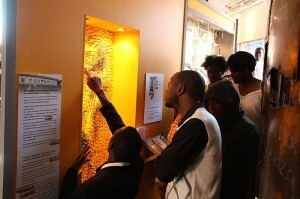 This is an interactive exhibition with recordings from the children themselves. It highlights the plight of the Forgotten Children who fled Zimbabwe’s political turmoil, in search of a better life, peace and security. Seen through the eyes of the children, you will be taken on a journey to share their experiences and amazing stories of hope and determination to succeed despite the challenges facing them. The Refugee exhibition was organised by the Solidarity Peace Trust in partnership with the Central Methodist Church (Johannesburg). Photos of the exhibition are credited to Laurin Berger. For more information about the exhibition, please contact Selvan Chetty. These are very powerful images. The children clearly worked very hard, and they’ve done an incredible job. They are a credit to the nation they come from. I viewed the images in sequence and felt quite emotional travelling their journey with them. Well done to all involved in helping to organise this and make it happen. Thanks to Bishop Verryn, a man of great honour and courage and to all Zimbabwean volunteers in different organisations in South Africa and abroad.Hats off to Fr Danisa Khumalo, a Catholic Priest running the Ministry to Zimbabwean Immigrants. As very well said by Robin, credit goes to the nation from which we come from but have turned our backs. Professionals who can do such brilliant work with the children have been reduced to nothing. Being forced to take up jobs well below their qualifications, only because of the desire to survive and send money home. I hold a Bachelor of Science Degree in Counseling, but believe you me, for 5 months i offered myself to work at a pre – school in order to earn a living, getting R1200 per month. Though very little, i appreciated it for the environment was better than the torture back home. Now it never rains for us, xenophobic threats are very loud and clear and one wonders where her next destination would be. Home never until peace and order has been restored. Lets solder on pals, we getting there.